Sometimes the hardest skill for an architect to master is restraint. The tendency is to put design more features than less when laying out a hole or a course. In some ways, golf course design follows the adage "less is more." Kingsley Club in Northern Michigan is a modern marvel of minimalist architecture. Architect Mike DeVries moved only 30,000 yards of dirt to construct the course. That's a fraction of a normal course. The minuscule amount is jawdropping when compared to Whistling Straits which moved over 1 million tons of earth! 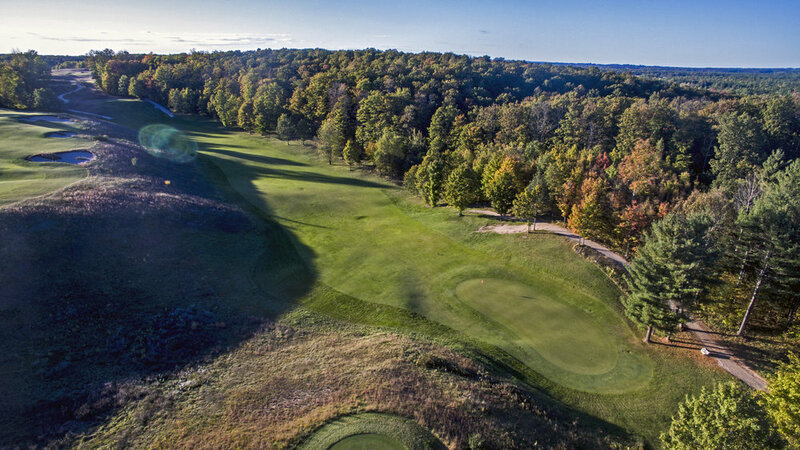 Kingsley's sandy soil and fescue fairways promote firm and fast conditions and highlight the natural land. An aerial of the 12th. The magnificent par four 12th showcases how a hole can be great without a single hazard. Instead of bunkers, DeVries uses the ground, and it's natural movement as the main obstacle golfers have to tackle. Walking off the par three 11th green, a dramatic vista welcomes players. The 12th tees off down into a low portion of Kingsley's unique rolling terrain. The slope of the fairway cants hard from right to left, making it difficult to keep the ball on the right side of the fairway, the ideal approach angle. An ideal tee shot would call for a cut into the right to left slope to hold the ball on the right side. If you can keep the ball right, the contours of the approach shot will help you. The green is narrow and long, a difficult target to hit with a mid-iron. The green presses into an influential ridge which kicks balls a little left of the green back on. The right half of the green has a subtle fall off which runs shots slightly right off the green into the chipping area. On the green, the slopes are subtle and understated. Well executed shots can yield a birdie, but trouble lurks in the holes subtle challenges. Approaching from the left side of the fairway leads those contours to all work against players. Any shot that's not perfect will likely find its way into the chipping area on the right. An aspect of the 12th I love is its subtle challenges. It requires precision and shotmaking from skilled players. The ideal way for a right-hander to play the hole is to hit a fade off the tee and a draw into the green. It's a supreme challenge. For the regular golfer, DeVries restraint with hazards makes the hole and par an attainable feat.